Welcome to our Rotary Family - Ryan and Valerie! 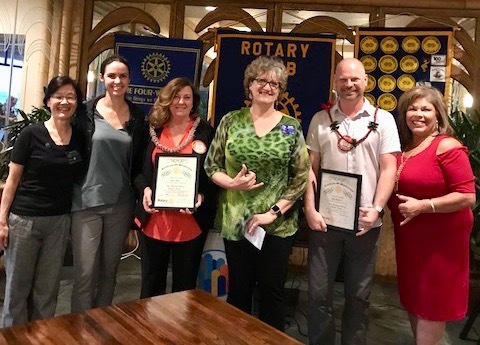 Welcome to the two newest members of the Rotary Club of Lahaina Sunset - Ryan Beenken and Valerie Kurtz. We had a wonderful induction last night led by ADG Marti Wukelic. Ryan's sponsor was Liz May and Valerie's sponsor was Katie Zimmerman. Welcome to our Rotary family! We are now at 29 members -- a wonderful number of folks willing to do do amazing things in our community!